Helena and I have just come back from the holidays with our family in Portugal and I would like to tell you how 2014 was a very good and special year in our lives. The big event that will make us never forget this past year was of course the birth of our daughter Olivia. Everyone who has kids will tell you how nice it is to have them and they’re right! All the tiresome, stress and lack of sleep is forgotten when we see her smile every morning. Helena and I love to travel and have made at least a big trip every year for a few years. With the baby, those trips have to be shorter but since she was born we’ve been already to Portugal (twice), Spain (visiting our old colleagues in A Coruña) and the U.K. (more particularly London). That thing that people tell you about how having a child changes one’s perspective on many things is also very true for traveling. Olivia can be very easily awaken by noises so now we realize how noisy some cars and motorcycles are… London was awful in that regard. The underground was noisy as hell, including the very loud voice warnings. Also, as a big European capital, I was expecting its public sites to be accessible but even in the emblematic Victoria Station there was no elevator to access the underground. The sad thing is that while the stroller is a temporary annoyance for us, people in wheelchairs have to cope with that permanently. We’re very curious about visiting Berlin with the baby to check those annoyances in there (because I seem to remember the underground being more silent and accessible) so that’s a trip we might do this year. The book count kept low this year: I read 3 books and started another one which I haven’t finished yet (REAMDE by Neal Stephenson). Even with the lack of time due to the baby, thanks to my wonderful wife I still keep playing squash and attending the CERN Micro Club once a week. Despite the awkward name, this is one of CERN’s many clubs and is concerned with technology, having several sections. I am part of the Robotics section in the club where we’ve been building a 3D printer. This means less time for my side projects so this year, unfortunately there was only a couple of versions of OCRFeeder and no new version of Skeltrack. I think that the only solution for OCRFeeder is to eventually have new contributors if there is an interest in keeping the project alive. About Skeltrack, although its development was stalled during most of 2014, my friend Iago keeps improving it for his Master’s Thesis, and I had a lot of emails from people who are using it. I even visited one of them at EPFL who is using the project with his own 3D cameras which means that having a device-agnostic library was a good decision. As for my job at CERN, I am finishing what I have been working on so I hope to talk about it in more detail soon. – Chão dos Meninos: an association from my hometown who helps children in risk — I always used to donate to big international projects such as Wikipedia and EFF but last year I realized that, since I don’t pay taxes in my country (because I live abroad), one way of contributing a small bit is to donate to an association such as this one. I still do not know what 2015 will bring but I do hope that the tendency continues and it turns out to be a great year again! 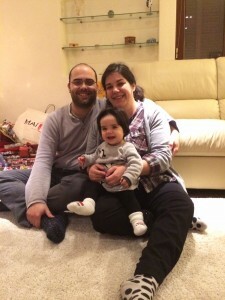 Author Joaquim RochaPosted on January 1, 2015 January 1, 2015 Categories CERN, family, gnome, ocrfeeder, skeltrack2 Comments on Happy 2015! What a crazy year this was! In 2013 many important events happened in my life that would make this a very busy year. To start, I began the year looking for a new job after 4 years working for Igalia. This meant that I had to travel a lot and move (with Helena) from the place I felt like home (the city of Coruña), having to say good bye to many good friends. This search also took me to the U.S.A. for first time where I met a very interesting company and people. Since Helena and I didn’t do our traditional travelling this year, going to San Francisco was definitely the most interesting trip of the year for me. I really want to visit it again some day together with Helena. Then I ended up joining Red Hat, where I kept working with GNOME technologies — mainly on the Wacom related pieces — together with some of the best Open Source developers in the world. I also moved to Berlin, the city I am in love with, which meant fulfilling a dream we had for a few years. My dear friend Chris Kühl helped make this move smoother so I have to thank him here again. After just a few months in Berlin, I received the positive result of an application to CERN that I had done before all this and I had to make yet another decision. We decided to do it and we moved out of Berlin just shortly after knowing that we will become a family of 3 next year! Our little girl Olivia will be born next March and we cannot express how excited we are about it! Life in this region is very different from Berlin’s (not bad, just different) but CERN is a very unique place and I am enjoying the experience. I need also to mention my parents who not only helped us with moving out of Spain but also drove all the way from Portugal to France in order to visit us and bring us our stuff. One of the things I miss from Berlin is the possibility to easily ride a bike anywhere. In here it is dangerous (drivers are crazy and there’s no bike lanes) and less convenient (Berlin is flat, here it isn’t) but I found another physical activity to compensate a bit my sedentary job: I started playing squash and I love it! As a result of all these changes, my personal projects got a bit neglected. I released only one new version of Skeltrack and OCRFeeder (actually I got a new version of OCRFeeder almost ready to ship) and I did a couple of quick hacks with the Leap Motion Controller. The number of books I read was also lower than ever this year. I read a couple of books by Cory Doctorow and a spy thriller called The Shanghai Factor. Not all things in 2013 were as great as my words might indicate. My grandmother (to whom I was very close) passed away a month ago. It was a very sad event, but she lived a long life and had her family beside her in every moment. About 2014, my biggest wish is that everything goes well with the baby and Helena. I think I will probably have to miss some of the Open Source events I usually attend but I got a good excuse, right? I hope it’ll be a quieter year than 2013 in terms of moving and that I can still dedicate time to my personal projects. 2013 was a year I will surely remember all my life. I am a lucky person to have had the opportunity of different experiences, to have friends in many places and to have my wife and family supporting me all the time. I wish you all an excellent 2014! Author Joaquim RochaPosted on January 1, 2014 January 1, 2014 Categories gnome, igalia, leap, ocrfeeder, red hat, skeltrack, wacom3 Comments on What a year! World Of GNOME has interviewed me again, this time about Skeltrack, my role at Red Hat and Open Source at CERN. If you would like to know more about those (there is even an animal shelter in the mix), check it out here.